Created especially for use with markers and watercolors, these pads feature multiple sheets of heavy, bright white paper for hours of creative fun. Whether for practice, teaching, or quiet time activities, teachers and parents trust Crayola products for fun, safe art materials. 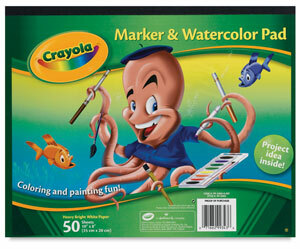 For best results, pair Crayola art materials with Crayola Marker & Watercolor Pads.